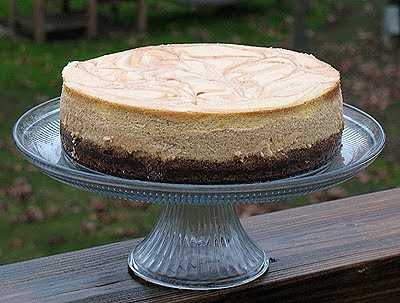 The amazing Emily over at Back to the Cutting Board posted this fabulous looking cheesecake on her blog just before Thanksgiving. I immediately bookmarked it and made it right afterward. Her cheesecake came out much prettier than mine, and my crust was a little difficult to deal with, but overall it was a fabulous addition to our favorite dessert list! 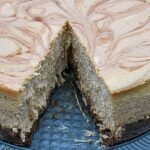 Emily created this recipe based off of her equally tantalizing recipe for Black and White Chocolate Cheesecake Supreme. I’ve also added that yumminess to my bookmarks. 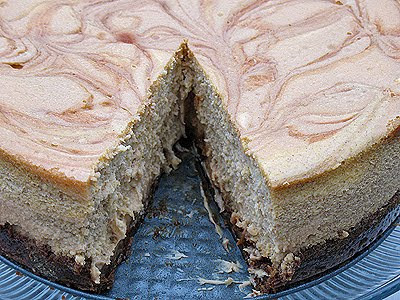 It actually looks similar to my Brownie Mosaic Cheesecake, which now that I think about it, I really must make again, it was so good! Anyway, on with this recipe. It’s a little time consuming, however the results are worth it. The flavor is marvelous, I just wish I knew why my crust ended up so difficult to cut. it was chewy, but hard to get a knife through. Overall, 2 thumbs up fabulous! Note: You can buy premade caramel sauce if you don’t want to make this from scratch. Get out your cream cheese, eggs and cream and let sit while making the crust so that they are at or close to room temp by the time you need them. Preheat the oven to 350 degrees. Mix gingersnaps, sugar, salt and butter in a bowl until combined and press into the bottom and about an inch or two up the sides of a 10? springform pan. Place in the preheated oven and bake for 10 minutes. Take out to cool. Turn off the oven. While the crust is baking, make the caramel: Cook sugar, corn syrup, water and a pinch of salt in a heavy bottomed, 3 quart saucepan over medium heat. Stir only until sugar is dissolved, then let the mixture come to a boil. Boil mixture until it turns a deep golden caramel, about 10 minutes. DO NOT STIR. EVER. Remove from heat and carefully pour the cream and vanilla down the side of the pan. Be careful, the mixture will bubble and steam. Turn burner to low and place pot back on. Stir carefully until the caramel is smooth. Remove from heat and let cool. In a large bowl, combine cream cheese, eggs, egg yolks and vanilla; mix until smooth. Add in the sugar, flour and heavy cream and blend until smooth. Do not over-mix as this will create more air bubbles which can contribute to your cake cracking. Pour 1/3 of the batter into a separate bowl. Add 1/2 cup caramel (if it has hardened too much, heat it up until it’s easier to pour). Mix until combined. Add the pumpkin and spices into the remaining 2/3 of the batter. Pour 1/3 of the pumpkin batter into the prepared crust. Drop in spoonfuls of the caramel batter on top. Pour in another 1/3 of the pumpkin batter and repeat the spoonfuls of the caramel batter. Pour in the rest of the pumpkin batter, it should be over 3/4 full, but not completely to the top (you may have some batter left over, it’s great for making mini-cheesecakes in mini muffin tins). Then drop in spoonfuls of the remaining caramel batter (cover the top, but don’t overfill). Finally, drizzle the caramel (again you may need to heat up a little) over the top and swirl it all around with a knife, but don’t overmix. Place in the oven and turn it on to 400 degrees (F). It should NOT be preheated. Bake for 10 minutes and then turn it down to 200 degrees (F). Bake for 3 hours. Turn the oven off, prop open the door slightly and let cool for 1 hour. 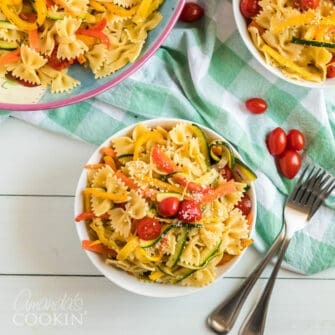 Finally, place in your refrigerator and chill for a full 24 hours before removing the springform pan’s side and serving. My oven never even reached the 400 mark by the time it was time to turn it down to 200. 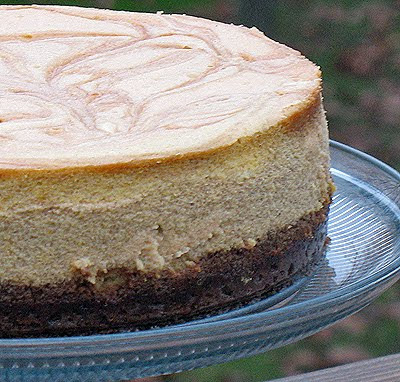 Looks yummy, I love pumpkin cheesecake. I make mine with chocolate swirled through. 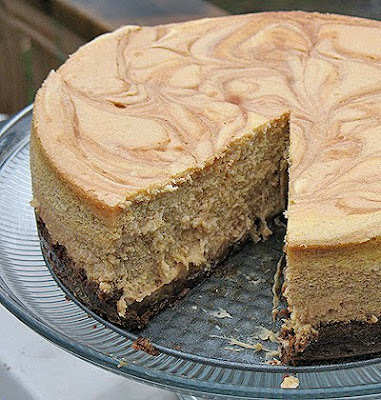 This really is a fabulous looking cheesecake! The flavors sound fabulous as well! WOW…2 great flavors swirled together. This cheesecake is outstanding!!! Emily, not sure what happened with the crust, but it was delicious anyway! Looks like one delicious cake! Fabulous cake! And I think your photo looks terrific! Copying now for next year! I saw the original post by Emily at the time, and thought it looked wonderful. And now to have your added confirmation is great! I know I'll get it made one of these days. Well done! This is beautiful and it sounds yummy too. Oh and the dough for those cranberry spirals is chillin'.